The villa is ideally suited for either families or friends .Only 4 miles from Saint Tropez and all its jet set activities , 1 mile from Port Grimaud which is the Proven�al equivalent of the famous venitian city , it is also a stone�s throw from the wonderful medieval village of Grimaud . And for those who enjoy meandering in the hilltop villages there are quite a few more such as Gassin and Ramatuelle . The villa has its own coded electric gate and there is plenty of parking next to it. At the rear of the property,the swimming pool/spa enjoys the sun all day and the large paved area gives plenty of space to either sunbathe or relax in the shade of the umbrella pine .The swimming pool has been fitted with regulation alarm . 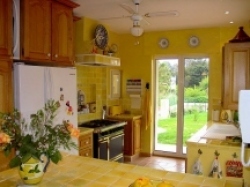 The house offers very pleasant and comfortable accommodation and is tiled throughout . It has terraces all around, a patio leading off the dining room with gas barbecue and teak table and chairs . Large paved area around the swimming pool giving both space to sunbathe or relax in the shade . Plenty of sun loungers and a boule area with a set of boules. 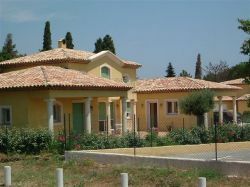 It is furnished and decorated to high standards with good quality appliances.